It was cold and rain had begun drizzling from the sky. I knew that I had to use the change in weather to my advantage and try to locate an eager bull. Moving down the draw towards a weep, the massive bull startled me as he ran out from behind a tree and circled around me. This bull had come in silently to my call. He stopped roughly 80 yards away, barking at me. I barked back and followed up with some soft cow calls. As he moved down the draw and out into the open I made my way after him as quickly as possible. At 60 yards he stood in the open waiting for me, staring in my direction finally bugling, chuckling and even barking occasionally. I had to be cautious in trying to close the distance a mere 10 yards to place him within bow range. Taking advantage of his nervousness, when he would spin around or consider taking off, I would close the distance. Finally, the bull was within bow range but I still did not have a clear shot. Two branches stood in my way of having a shot at the bull and I just couldn’t risk having an arrow deflect. Silently I prayed for enough time to maneuver into a good shooting lane but my prayers went unanswered. When the bull had enough he wheeled around and took off down the draw never to be seen again. Leaving camp in the rain, I headed to a rock point to bugle a draw that I had a trail camera located on all summer long. I had not hunted the draw over the course of the season as my trail camera had only produced photos of three bulls in the three months that I had it out. Not to mention that most of the other public land hunters were coming in and out of the area on a game trail that was located on this very draw. In fact, that morning, my dad called the draw in an effort to help locate a bull on his way out to get the mules without any luck or response from a bull. As soon as I let my locate bugle out, a bull responded with a scream. Game on!!! Finally, I had received the aggressive bugle that I had been waiting all season for. The bull was over a mile away, so I silently closed the distance knowing exactly where he was. I set up two decoys and began a calling sequence hoping that the bull would drop down the ridge far enough allowing him to see my decoys and come within bow range. The wind was bad, it was blowing straight up the draw so I had be extra cautious where I set up as to not have him catch my wind. The bull came down and stopped at about 80 yards bugling occasionally, but he was mostly listening and waiting as these smart old bulls often do. 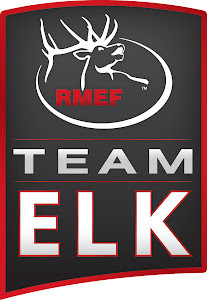 I knew that he was not going to come any closer, so I grabbed a decoy, slipped off my boots, and coated myself in an entire container of Elk gel to help mask my scent. Putting Under Armour’s scent capture technology to the test, I was going after this bull with the wind blowing straight to him in a desperate attempt to make something happen. As I made my way silently up the open draw, I placed my decoy in front of me with the expectation that I would be seen by the nearby bull. I was right. Just as I crested a small rise in the ridge, there stood two bulls, one a spike, the other unknown, and both less than 40 yards away. Silently I stood there hoping that the bulls would not charge me or bust out of there as the wind was blowing right to them. After a few moments, they lost interest and walked off, the spike going to the left and the unknown bull going to the right. The unknown bull then let out a locate bugle from the top of the next ridge. 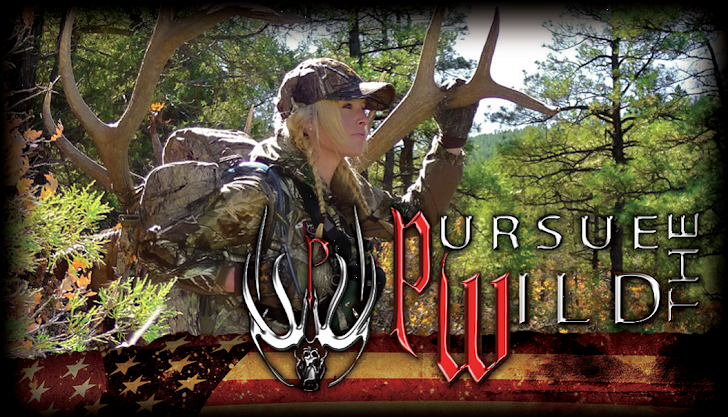 Back in the game, I folded up my decoy and continued my bare foot pursuit of the bull. Not wanting to cow call or bugle to re-locate the bull, I stood at the top of the ridge listening for a clue as to where the bull had gone when I heard what I thought was two bulls fighting. Seizing the opportunity I moved quickly towards the noise and snuck up on the massive bull while he stood thrashing in a wallow flinging mud with his antlers. Taking a few moments to turn on my video camera and zoom in on the bull while he was looking directly at me (note beginning of video below) I was able to capture the ending of this extra ordinary hunt on camera. Having no shot on the bull’s vitals, I waited for him to continue thrashing in the mud to make my move into position for a broadside shot. Everything was perfect, the bull stood broadside with his head behind a tree unable to see me. His vitals were perfectly exposed, ranged at 41 yards. It’s go time!!! Just as I begin to draw my bow he stepped out of the wallow and slowly moved up the ridge completely unaware of my presence. Ugggg, you have to be kidding me!!! I ranged him again, 52 yards, still within range and he moves again. This time, I’m not so lucky and he spots me moving and I no longer have a shot on his vitals. The bull continued to move calmly up the ridge and out of range. I am still losing sleep at night as this bull was a magnificent 6x6, roughly 50 inches wide, I’m guessing 315-330 inches. 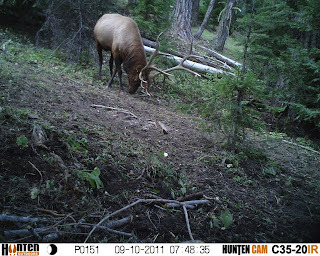 I have a trail camera photo below of the bull I believe him to be. He is one of three bulls that were captured by my trail camera on that ridge. This year, I was gifted with the thrill of fair chase, do it yourself hunting, both solo and with my dad at my side. Having had the opportunity to harvest countless cows, spikes and five branch bulls in pursuit of a big mature bull on public land, no easy feat; I was finally given the opportunity to chase after my dream bull. That is what keeps all of us public land hunters coming back every year. It just doesn’t get any better than that. My dad and I enjoying the view. Packing out camp on Otis, Chester and Fury.